We have hired a new groomer, finally! Sorry for the delay, but we wanted to find the right one. Her name is Mariah. She and her family recently moved to the Triangle area. Mariah has 14 years of grooming experience, on our services page you can find photos of a few of her dog grooms. She also grooms cats. 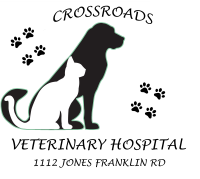 Crossroads Veterinary Hospital offers our clients and their beloved pets the most desirable characteristics found in the veterinary industry - Compassion and Quality Medicine. Our hospital opened it's doors in 1989 as a small, one-doctor practice and has developed into a successful, multi-doctor facility; thanks to our many dedicated and loyal clients! Most importantly, Crossroads has maintained the warmth, sincerity, and "small-town" atmosphere while growing into a professional and advanced medical facility. We have just finished and launched our new website! If you notice anything that you used from our old site which is missing please let us know.